The Hacker’s Diet isn’t really a diet, but rather, it’s a set of tools to allow anyone to manage their diet. The core of it are a set of spreadsheet tools that calculate a weighted average of your weighings and then do trend analysis to figure out how much weight you’re actually losing. To simplify, your weight can fluctuate by as much as 6 pounds over a couple days, due to eating, taking in and losing water, etc. It’s hard to see any weight loss in all the fluctuations, especially if your weight loss goals are modest. The author, John Walker, founded Autodesk, and helped to write AutoCAD, the popular drafting software. The tools he’s presenting are the tools he used to lose weight himself. As time has gone on he’s created a web based online suite of tools. These eliminate the spreadsheet and allow people to manage their weight using only a browser. I took one look at it and decided, no, too public. And I didn’t want to play with Excel or use a PDA to manage my weight. To note, a fellow named Jon Thysell has released a version of the Hacker’s Diet spreadsheet for the open source office suite OpenOffice.org. He calls it Weight Tracker ODS, and yes, I’ve downloaded this and will fill out the spreadsheet and will track weight loss over time. For those with a bent to using WordPress, there is also a Hacker’s diet plugin for WordPress. This little tool was written by Keith Thornhill and is available here. Another spreadsheet oriented weight loss tool is that of Jeremy Zawodny. Again, there is a spreadsheet to track weight loss but other tools to track input. And yet another hacker, Matt Griffith, developed a set of online tools after exposure to the Hacker’s Diet suite. He calls his online dieting tools physicsdiet.com. Update: A Hacker’s Diet style application for the iPhone is the product True Weight, by the software house Made Up Software. I was poking around the web, looking for references to wor sue duck (almost none, but plenty of references to wor shu duck) and found this old thread discussing Americanized Chinese dishes people liked. The discussion continued for a good 14 months, and seems as topical today as it did two years ago. My first thought, ironically, is that I hope my announcement and Chow Down Atlanta’s announcement don’t collide. Best I can figure out, she founded her blog in late February, 2007 and mine was founded in late February, 2009. And when I began, I was probably inspired by Darla’s blog Snellville Eats, and wanting to say more than I could as a guest. As compared to politics, which divides, food brings people together. There are food bloggers whose politics I know I don’t share, but are wry, observant, smart people with plenty of humor. Food seems to bring out the best in people. This has also been a year of changes. I was at my heaviest when I began this blog and my doctor said I had to lose weight. I lost 25 pounds before knee and foot problems did me in. Foot problems flared up again in February this year. I ended up in the hospital overnight for the first time since I was three, and afterwards knew pretty much I’d be fighting gout and blood sugar issues for the rest of my life. On the bright side, learning about this explains a lot of things I’d seen over the past two years, and exchange dieting just works. Since my foot hasn’t completely healed yet, let’s put this in perspective. I’ve just lost close to 10 pounds in less than a month with no exercise program at all. Think it can’t be done? No it can. It’s just tedious to do. If you log everything, count everything, you will lose weight. Though exercise is a work in progress, I’m looking for ways to do aerobics without putting stress on my flaky leg. It turns out that some Gwinnett County parks have indoor swimming pools. The Bethesda Church Road facility, just south of the Bethesda Church Road and Ronald Reagan intersection, is one such facility. A county resident can swim there for a fee of $5.00 a day. My wife and I have also been shopping for bicycles. She grew up in a family where they all shared one bicycle. We haven’t owned bikes for a while, and we want to be able to ride together, once again. Because our cars are so small, we’ll need a bike rack before we ever buy a bicycle. So we’re shopping for bike racks as well. In terms of dieting, as a rule of thumb, it’s unsafe to lose more than a pound a week. The obese don’t have that issue, but still, it’s better to plan on losing weight slowly rather than quickly. So, thinking ahead on those terms, and planning for a month or three of oops issues, it should take a long time to hit my optimum weight again. That said, without monitoring my eating carefully, I just don’t eat enough when I diet. Unmonitored I seem to eat about 1,200 to 1,400 calories, and that’s not healthy for me. Cheese helps with this. Good choices to add calories and bulk to a diet are the high protein low fat cheeses. I’ve been fitting in Baby Bel light cheeses, as they have a good protein:fat ratio (6g:3g, similar to lean meat), and mozzarella sticks help as well. 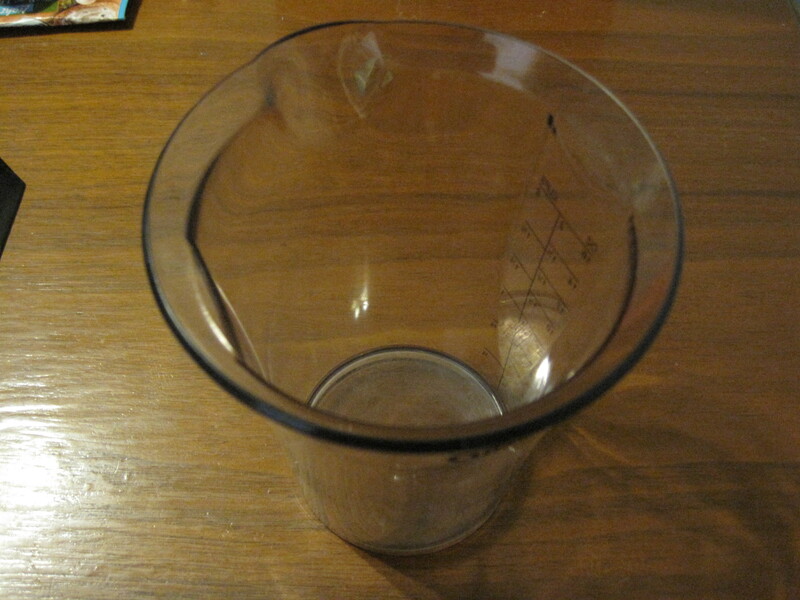 I haven’t gotten the whole scoop, but I’m hearing that vinegar can help lower blood sugars. So I’ve been sprinkling red wine vinegars on my raw vegetables. It tastes pretty good, actually. Chocolate is something I can tolerate pretty well. I had one chunk of this at dinner without issue. 200 calories and 3 servings of fat are nothing to sneeze at, when you need to eat more. Most useful kitchen appliance: I bought a Cuisinart stick blender, and though the blender gathers dust, the very nice 2 cup measuring cup that came with it gets used for everything. Kitchen appliance I really want to have: An oven safe skillet. “Ad Hoc” has me interested in pan roasting. I don’t know what’s good, but I look a lot at this pan during my off hours. I’d be happy to hear recommendations. Best Place I Ate Last Year: This is probably a tie between Watershed and Indigo. Benny’s would have won this outright, had it remained open. But since I can’t recommend a place people can’t go to, I’ll recommend those two eateries. Best Place to eat in Snellville: At this point, it’s probably Bonefish Grill. I don’t like the noise there, but the seafood is awesome. Best Place to drink in Snellville: Summit’s Wayside Tavern. In my opinion, it’s the best place to drink east of the Brick Store Pub. Best Burger Last year: With all due respect to the American wagyu burger at Summits, the best I had was the burger at the Vortex in Little Five Points. Sexiest Eatery Last Year: Mitra. My daughter turned off her iPod and sang along to the music there. Just get rid of the overly hip men with blue lasers in their bluetooth headsets and it would have been perfect. Biggest Surprise of the year: That a cousin of mine would have been married to a man who had a winery. Larry Tiberia’s Barking Rocks Winery was a pleasure to see and tour. Funniest Food Blogging in Georgia: I’d call this a tie between Savannah Red’s “road rage” review of Fellini’s Pizza and almost any comment Live to Feast starts making when he compares a cut of steak to his beloved ribeye with bone in. Red’s review may be an acquired taste, but it captures simultaneously the anger and embarrassment at the anger when people get mad on the road. And Red, taking the kinds of enormous risks he does when he writes, manages to tie it all to a pretty decent review of the restaurant. Not to be ignored are Foodie Buddha’s “finds”. The Rubic’s Cubewich was precious. Grateful for the Reunion: Meeting my uncles, cousins and their descendants in Granbury, Texas was worth every second of that drive, even if I lost my brakes part way through Texas on the way home. Did you know they named the basketball court in Granbury High School after my aunt? Grateful for their hospitality: This goes to Lindsay Z, for hosting the party at FAB, and to BuHi, for his small party in the Chinatown food court. Gracious hosts. I have nothing but gratitude for their efforts in this regard. There are probably a dozen other bloggers I should mention, but subtle and grow on you are people like Amy, Jimmy and Sean. I’ve never met Hardy, perhaps some time when I’ve grown comfortable again around alcohol. Patagonian Toothfish, you’re not on the side bar but it will happen. To the rest of you, best wishes, and a happy 2010. 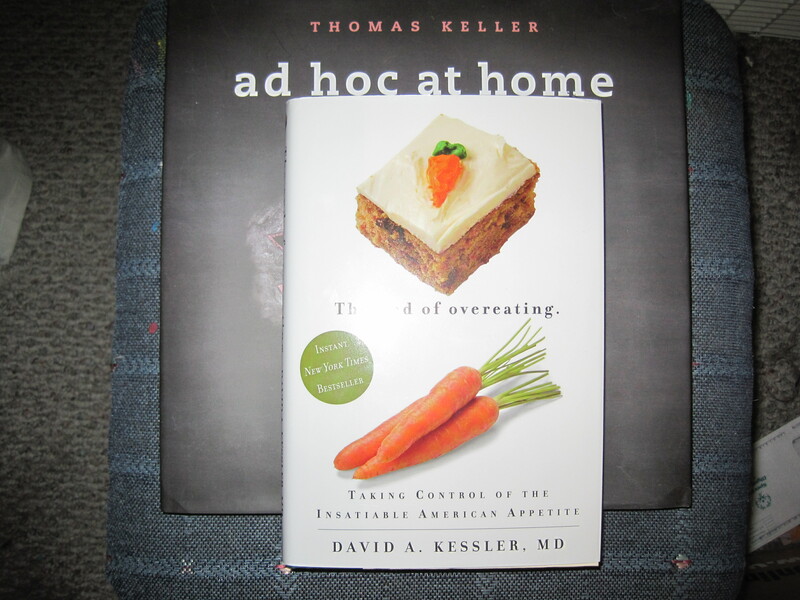 Two Books – Ad Hoc and The End of Overeating. The first I’ve only glanced at, the second I’ve read a couple chapters. But both Thomas Keller’s “Ad Hoc” and David Kessler’s “The End of Overeating” are important books for the fans of food, or anyone curious about how restaurants (and other commercial establishments) go about making their customers want to eat. Kessler uses a ton of repetition and observation to drive home his points. He talks to an unnamed industry insider, points out the constant use of double frying to embed even more fat into foods. The point of all this is that foods high in the “three points of the compass”, salt, fat, and sugar will tend to entice the appetite. This effect has been studied repeatedly in the lab. Then by chance, he put a rat on a lab bench near some fallen Froot Loops, the high-calorie, high-sugar cereal. He was struck by how fast the animal picked up the cereal and started to eat it. Sclafani turned that casual observation into a more formal experiment. After familiarizing test animals with the taste of Froot Loops, he let them loose in the open field. Rats prefer to stay in corners and won’t readily venture across a field to eat chow pellets, but when Froot Loops were available, they scurried over to them. One useful thing that the Kessler book does is talk about thin people obsessing over food, even when they’re not inclined to eat. I’m finding that personally useful as I’m to a first approximation, hungry all the time, except after dinner. It’s only at dinner time I can get the volume of vegetables to feel “satisfied”. It is nice to know that I’m not alone. Kessler’s thesis is easy enough to test. I’ve done it inadvertently a couple times. The tacos at Garcia’s left me ravenous. And if you try, oh, some bread and a teaspoon of olive oil, and then try enough green olives to match the fat in the oil, the shock of the salt and the taste of pimento will create more of a “taste sensation” in your mouth, and in my case, certainly more of an urge to eat or drink. Fresh Market (Suwanee), and are high end groceries diabetes friendly? My wife has been wanting to got to Fresh Market ever since a coworker of hers, one with a diabetic husband, recommended it as a place to get things friendly to a diabetic. Now I have been to the Dunwoody Fresh Market. The easy availability of fresh fruits, quality meats, and small portion cheeses doesn’t hurt. However, I tend to think the main supermarkets, such as Publix and Kroger, are better places to get diabetic specialty items, things like sugar free jams and preserves, Glucerna bars, etc. Anyway, before I tee off on the high end groceries in general, let’s talk a bit about the layout of Fresh Market. On entering you pass through flowers and the bigger editions of these stores have a florist on hand. Next is fresh produce, which is of good quality and tends to be expensive. If you want things like exceptionally sweet carrots or golden raspberries, they have them here. In terms of size, this one is more Trader Joe’s sized than Whole Foods sized, but there are still important differences between Joe’s and Fresh Market. Unlike Trader Joe’s, the two Fresh Markets I’ve seen have bakeries and a butcher and a good but small collection of fish. There are a lot of prepared sweets in Fresh Market (none of which I can eat) and they have a deli-like section to get things like Boar’s Head meats and high end cheeses. They have good breads and an above average collection of dairy products. The store in general is full of eye candy and an interesting place to shop. 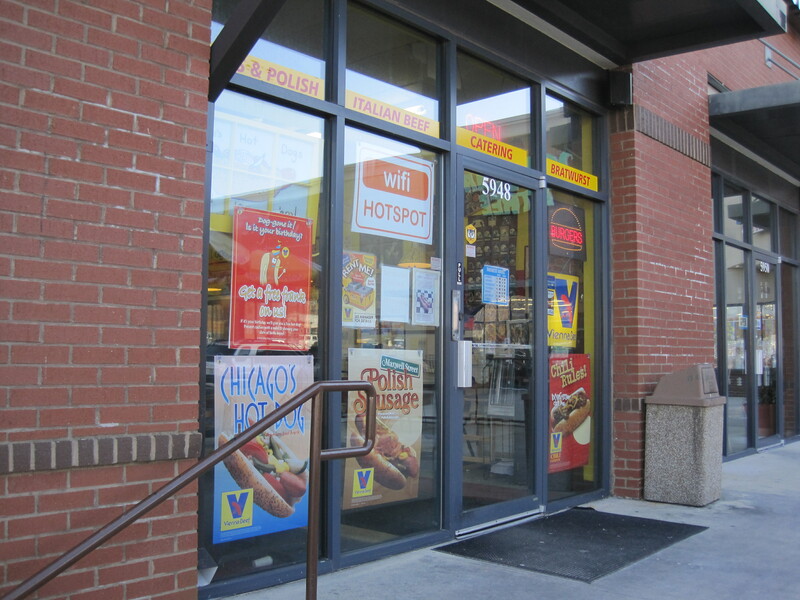 Are the high end grocers diabetic friendly? To be brutally honest, I don’t think any high end grocery deserves to be called diabetic friendly, because they’re not. The sheer quantity of unmeasured, excessively rich prepared foods guarantees that. And when they offer prepared foods I can eat, like cooked whole grains, or a beef stew, where are the measuring cups? Tongs and oversized bowls don’t cut it under these circumstances. Having to walk through these displays to get to cash registers and not having an effective way to partake is almost criminal. That said, I don’t think they deserve the phrase diabetic unfriendly either. Small portions of protein and fats are key to someone like me being able to keep up my calories outside the home. Nuts, olives, small meat and fish portions and especially low fat cheeses make my quality of life much better. Rich selections of oils add variety to the kinds of food I can eat because two things I can be versatile with are fats and proteins. I can eat almost any vegetable, and it’s hard to eat too many. Fruits I can eat in measured quantities. 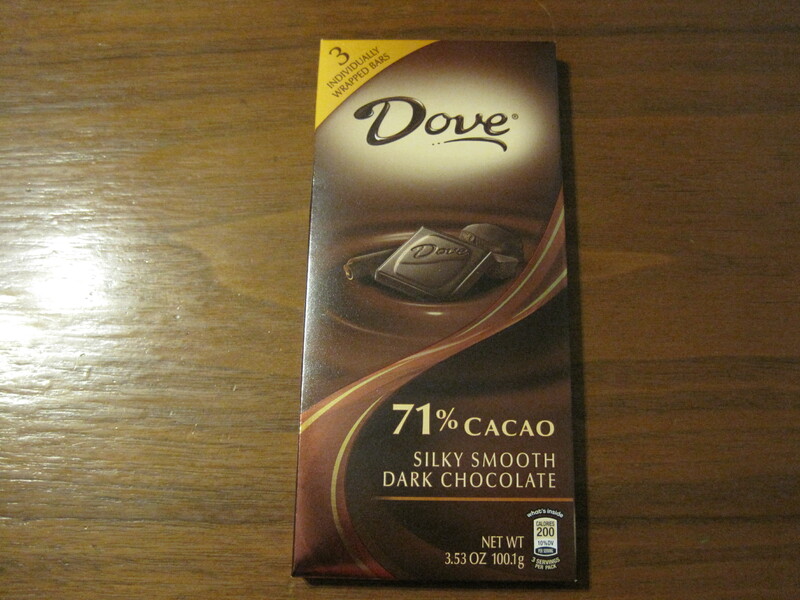 Some diabetics can fit in the high cocoa chocolates (70% or more) as a calorie boost. One of my issues when dieting is that I don’t eat enough. One way to boost my caloric input during the 2.5 meals I have to eat at work is to keep canned fish around. Sardines would be perfect, but they are also rich in purines and that doesn’t sit well with my other health issues. I like canned salmon when I can get it. I didn’t find any canned salmon at this Fresh Market but I did find canned mackerel. This Fresh Market has a rich collection of olives, which are diabetes friendly and a wide variety of ounce sized cheeses. 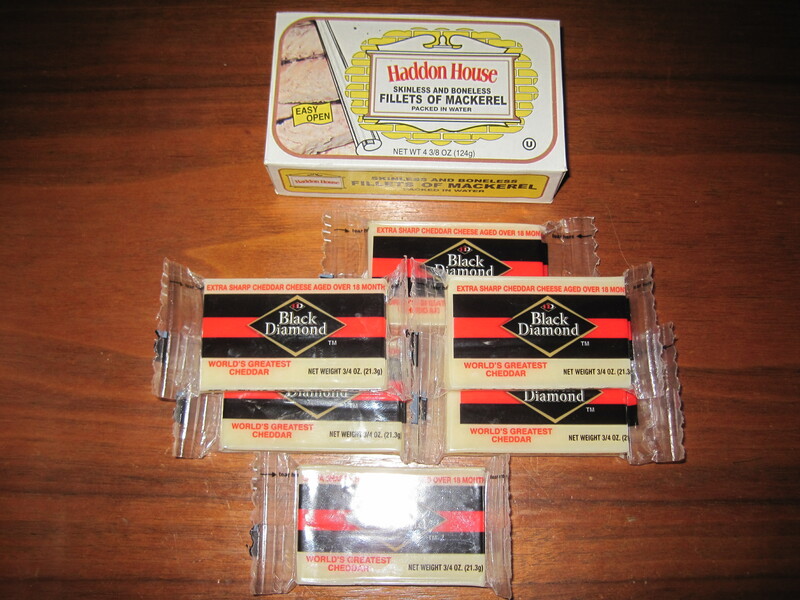 They even had Black Diamond, a cheese that in the 1980s was proclaimed by some to be the best cheddar in North America. 3/4 ounce slices make it easy for someone like me to make last minute adjustments in a diet lacking calories, and in the process, I’m not giving up quality taste. Black Diamond: 7g protein, 10g fat per ounce. I’d have to say finding how how diabetic sensitive tortilla and potato chip labels are to diabetes was an accident, and I’ll note that Jeff’s article on Adventurous Tastes, titled “Is the Serving Size Game Coming to an End?” was a key to noticing this. He was complaining about how stupid chip labeling is, that they use a portion size that’s ridiculous. I was agreeing with Jeff and while doing so, actually read the label and noticed the magic number: 15 grams of carbs. 15 grams of carbs is one starch exchange, the size of a single serving for a diabetic. All I can conclude is that someone in the chip industry has diabetes, or a relative with diabetes. Recently I went to the closest Walgreens to me and looked at the carb portion of a single serving size of every bag of chips, tortillas, tortilla scoops and popcorn I could find All of them had a serving size whose carbs ranged from 13 gram of carbs to 19 grams of carbs, and a substantial plurality were dead on 15 grams of carbs. So, it appears to be an industry wide phenomenon. 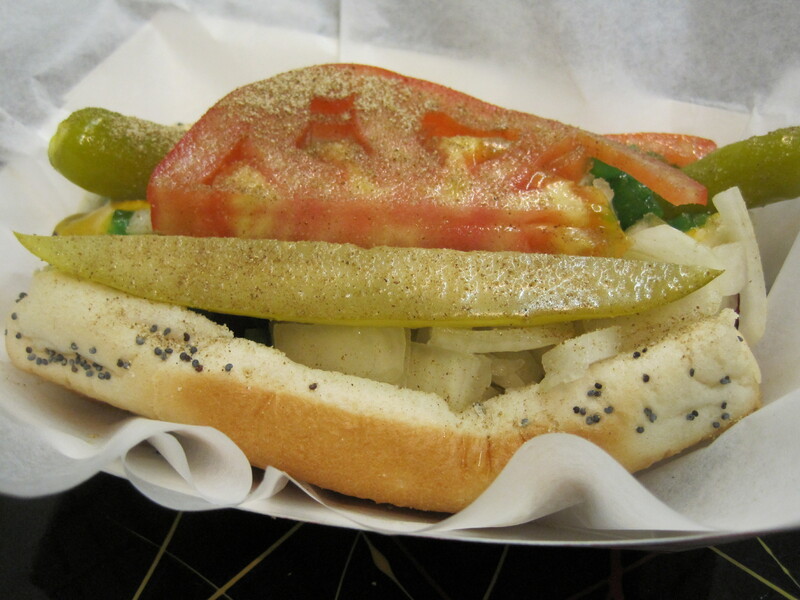 Happiness is knowing that even on my diet, I can still enjoy the delicious hot dogs at Mike’s Chicago Hot Dogs. Yum! 2 starch, 1 meat, 1 fat exchange. Evidently, Mike’s is also a Wifi hotpot. You can surf and eat at the same time.